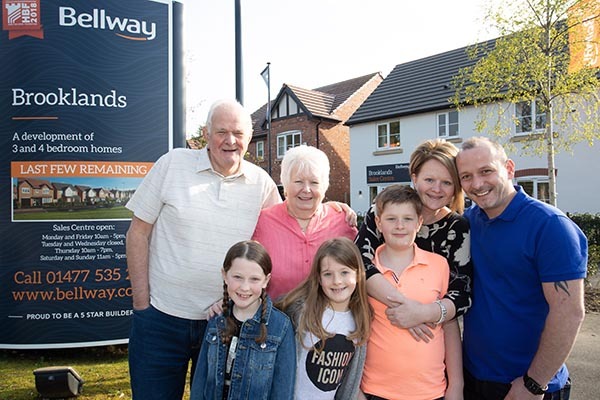 With its prime location just a short walk from Holmes Chapel, Bellway Homes’ Brooklands development on Marsh Lane is proving to be a hit with one particular family, with father and mother and then daughter all buying at the scheme. First to buy was Harry and Carol Brett. They previously lived in Altrincham but wanted to be closer to their daughter Paula Yarwood, her partner Umut Karan and their children Isla (aged 7), Emilia (aged 7) and Jack (aged 9) who lived in Chelford. After doing some research in the area, Harry and Carol came across Brooklands and were impressed with the modern properties at the development and its close proximity to the village. The couple bought the Oakwood house type, a four bedroom detached home, and have settled in immediately. After visiting her parents in their new home, Paula, who was renting in Chelford, decided to buy at Brooklands too, also purchasing an Oakwood. Paula says: “The children go to school in Chelford, so we chose to rent there, but the houses are just too expensive to buy. The children will ultimately go to high school in Holmes Chapel, so looking ahead, we wanted to buy in the area and loved the properties at Brooklands. Plus, the village is great with lots of amenities. Paula and Umut took advantage of the Government-backed Help to Buy scheme. Paula concludes: “The children love the development and the space it offers; they can ride their bikes and roller skate. With other families living here too it is a very friendly development and the children all play together. And the children can’t wait to decorate their own rooms in the new year – the girls already have it planned! Ideally located in the village of Holmes Chapel surrounded by stunning Cheshire countryside, yet just 25 miles from Manchester city centre and only 20 miles from Stockport, Warrington and Stoke, Brooklands is a beautiful development providing a selection of four bedroom detached homes. Prices start from £317,995. For further information, please contact Bellway Homes on 01477 535254 (open Monday and Friday from 10am until 5pm, Thursday from 10am until 7pm and weekends from 11am until 5pm). Alternatively, please visit www.bellway.co.uk.